Neither this dish or the Five Ingredient Lunch was conceived or cooked with a five ingredient shtick in mind, but I guess it’s a reasonable number of flavours and textures to put in food if it’s not to be too messy on the palate. Actually, what I really mean is five main components, since ingredients should also include for example salt, pepper, water and oil. This has kindly been pointed out to me by people who are as nitpicking and obnoxious as me, so I’ll just smile and wave and claim artistic liberty. As you can see, this photo has plenty of motion blur, because the little red compact camera and I have different opinions on how photography is best carried out. 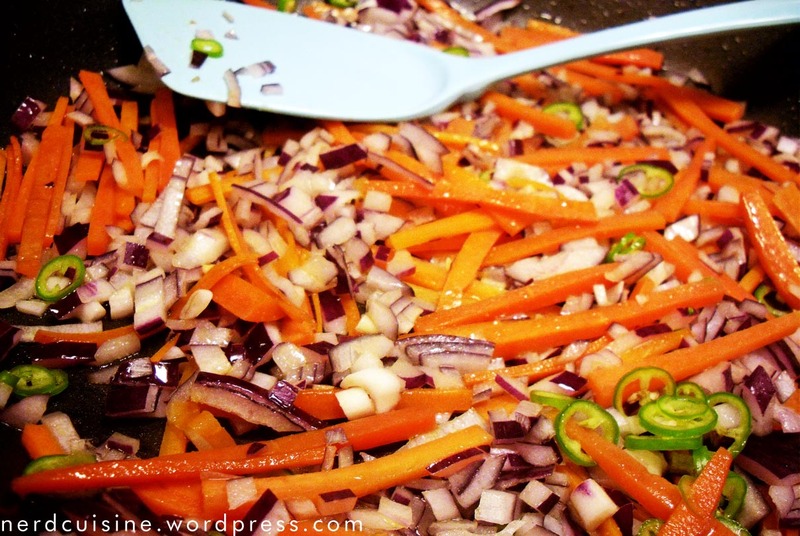 The ingredients are: shredded beef sirloin, which has been marinated in a mix of soy, water, garlic and vinegar, rice, carrots, red onion, green chili pepper. 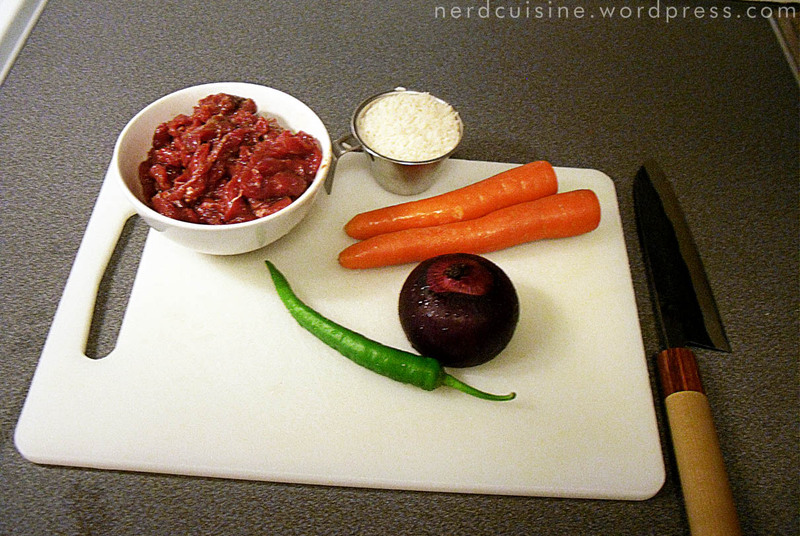 Rice is in the pot, meat drained of surplus marinade, and I simply can’t help but like pictures of prepared ingredients on cutting boards. 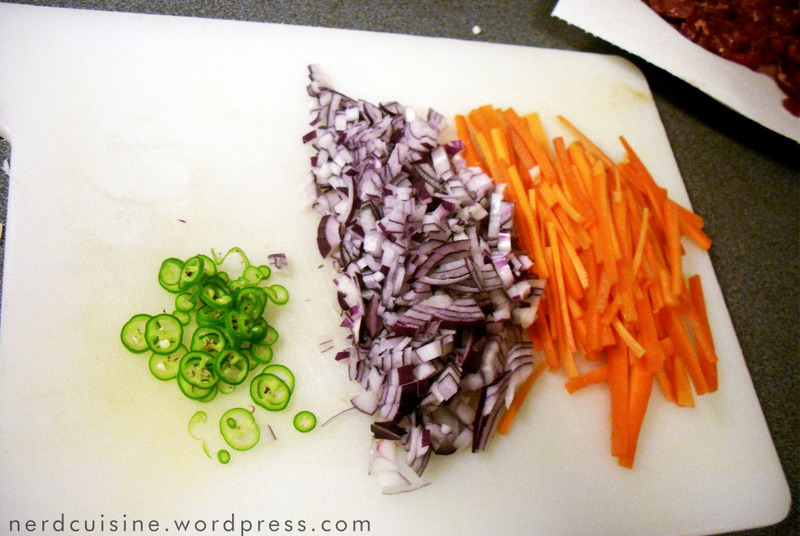 Especially when the cutting was done with a lovely Japanese knife – a knife that’s so sharp I won’t use it when I’m in a hurry. 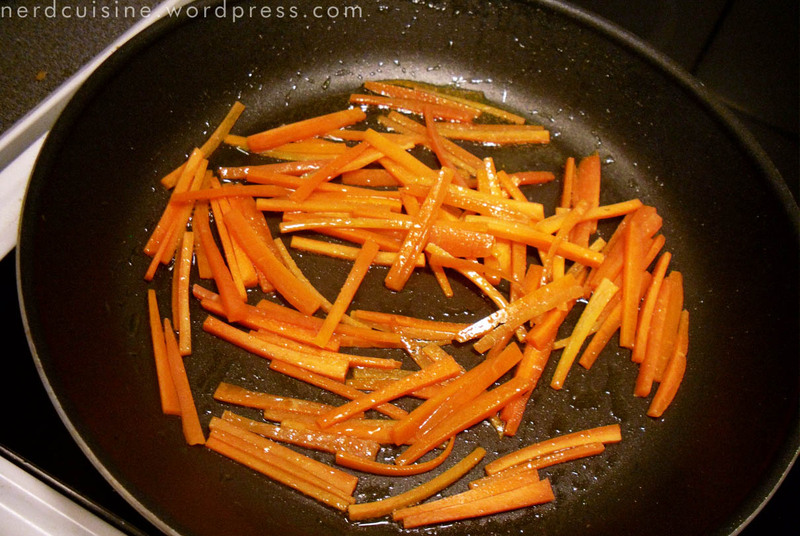 The carrots are the crunchiest ingredient, so they fry first. Adding meat. Sirloin of beef bought shredded like this is of course the trimmed off pieces of a proper steak, but a good way for stores and suppliers to minimize waste as well as a neat way for cheapskates like me to get good meat at reasonable prices, since a tray of shredded meat like this comes at less than half the price of a whole piece of sirloin of equal weight. There’s no point in trying to cook these thin shreds medium; focus on getting a good sear and the marinade will keep the meat reasonably juicy anyway. 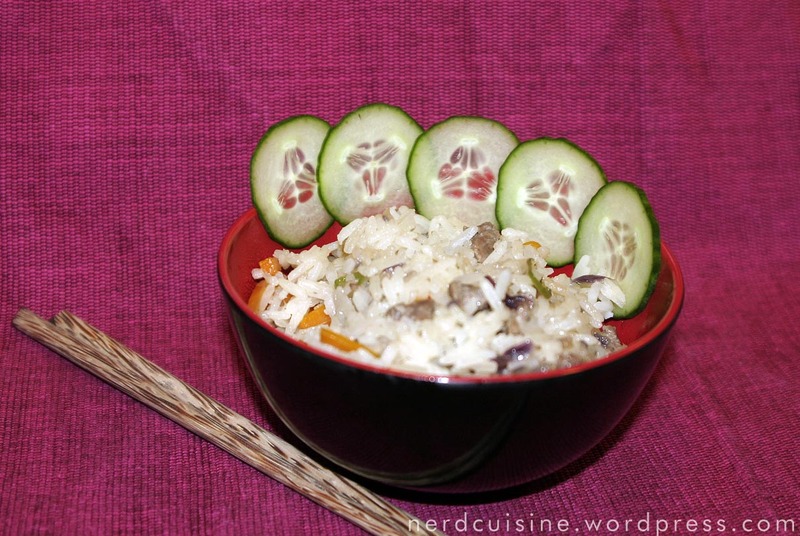 Long time readers (if there are any, I’m not sure) will have noticed that I often mix everything in rice dishes. 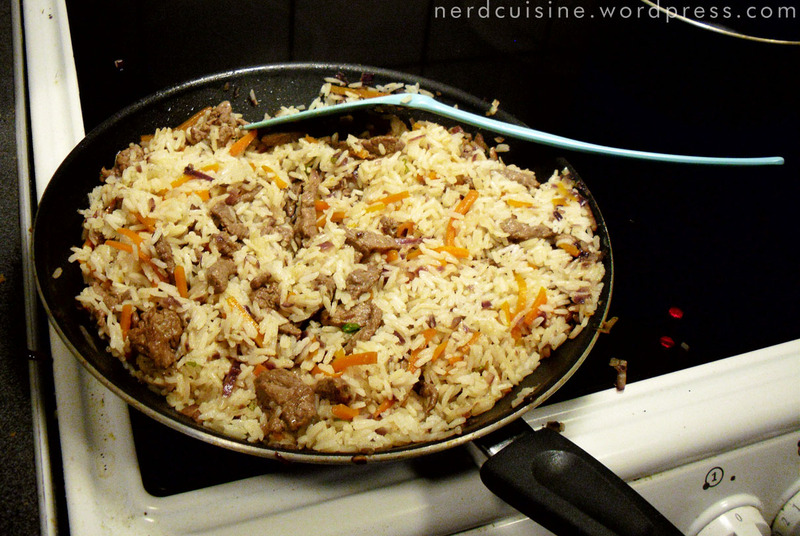 I think it’s a good way to spread flavour around and get the rice a bit more interesting. 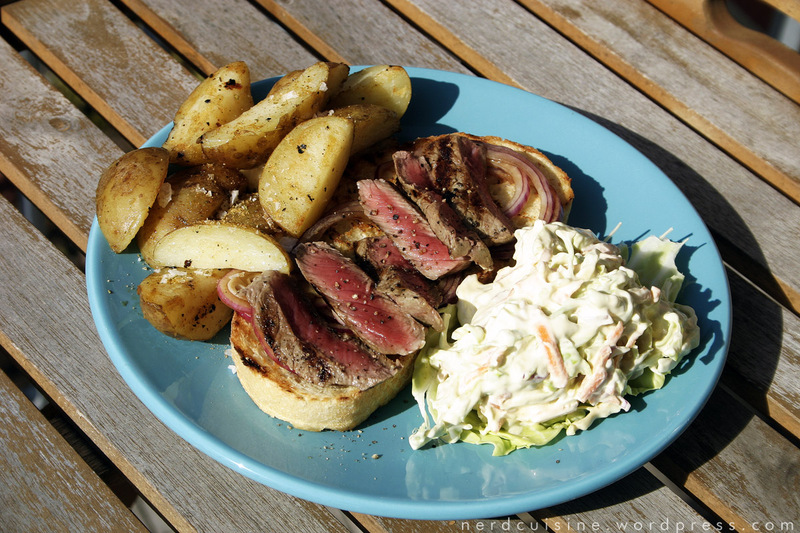 It does seldom look very posh, but elegance isn’t the only way for a dish to appeal visually. Then again, with a bit of effort, the completed dish can still look fairly posh. 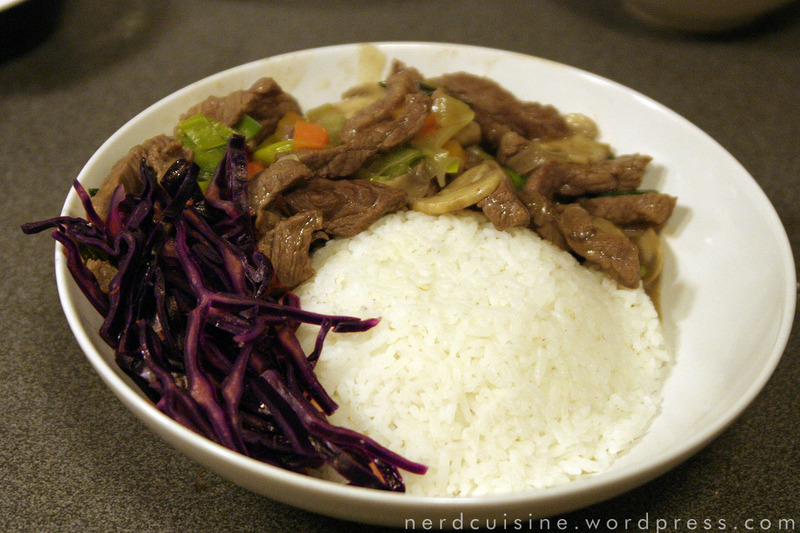 I seem to recall that I’ve hinted about making too much ‘Asian’ food (it was probably the herring), but yesterday I watched Kung Fu Panda for the first time which left me with a hankering. 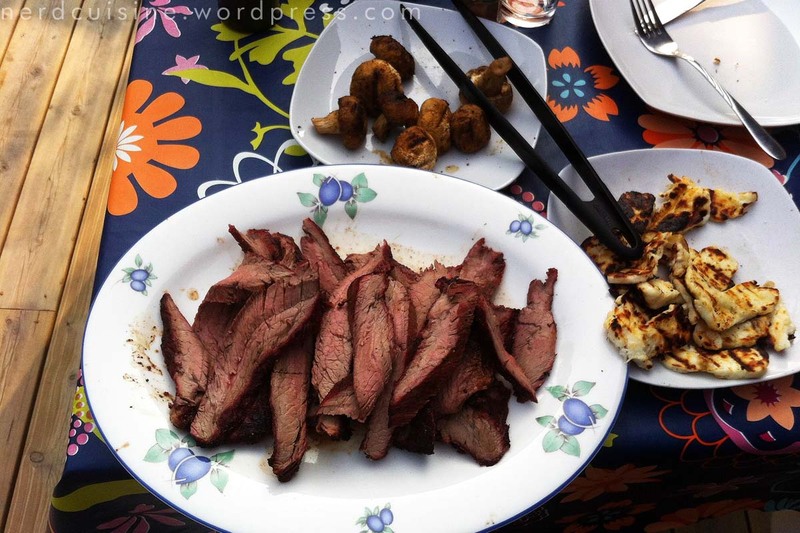 Chinese food in Sweden is basically one man’s wo(r)k since almost all the Chinese restaurants I’ve visited in Sweden copied their menu from the first one, opened in Gothenburg 1961. As a result, Swedish Chinese food is probably a whole lot blander than the Guangdong kitchens it originated in. 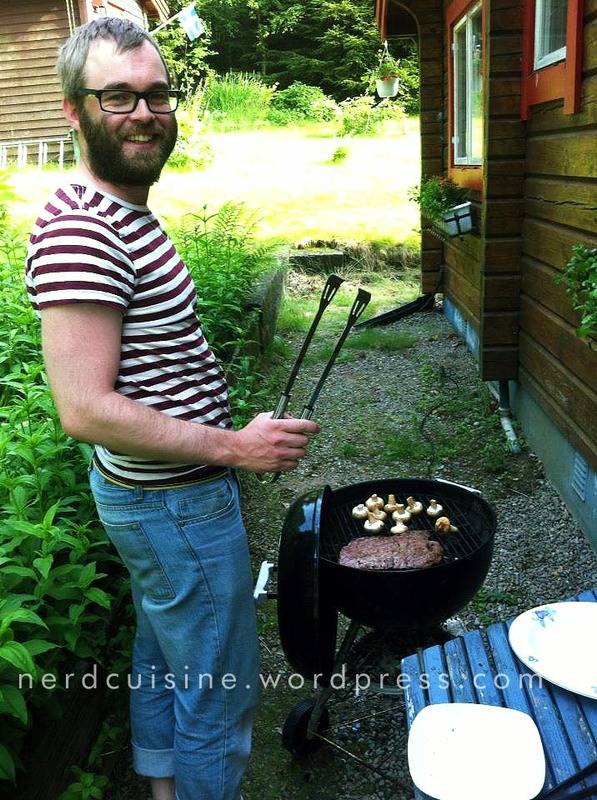 My recipe today aims to draw the best from the Swedish Chinese food culture and add a bit of me to the mix. Ingredients! 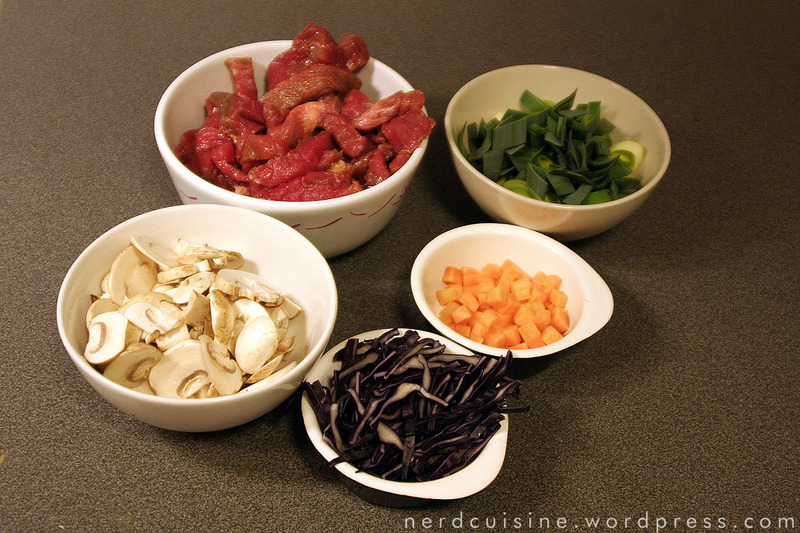 Beef, mushrooms, leek, carrot, red cabbage. There’s other stuff too, but I didn’t put it in the picture because I had done a lot of stuff already when I decided to take photos. 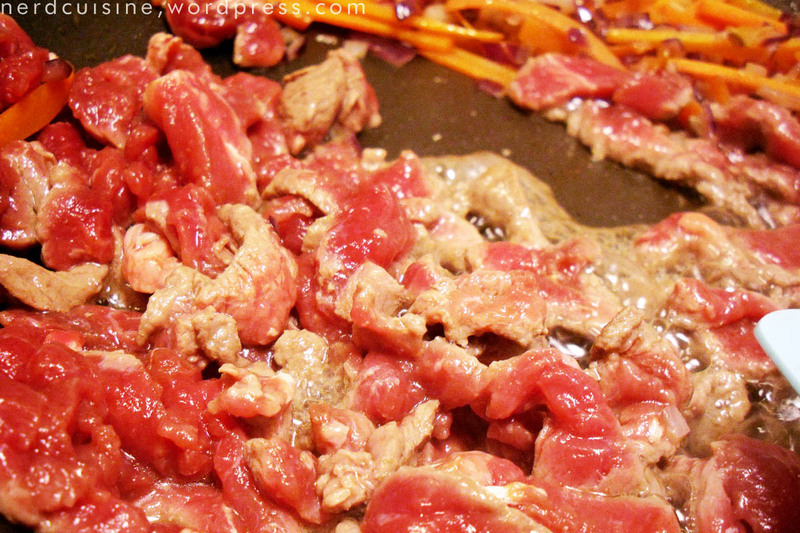 The beef has been marinated in a mixture of soy, white wine, oil, garlic and powdered chili. Rice is already done. 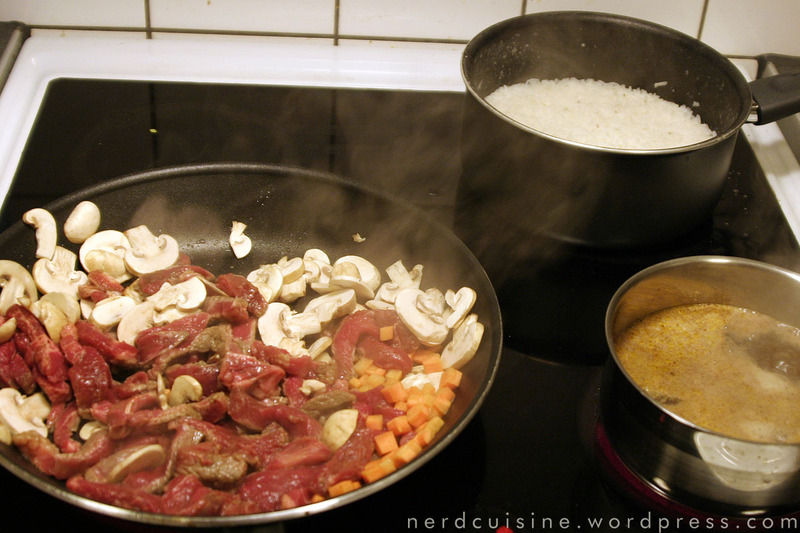 Meat, shroom and carrot is sizzling away and the small pot holds a broth made from beef stock cube and the marinade. Broth goes in pan to simmer along for a while. 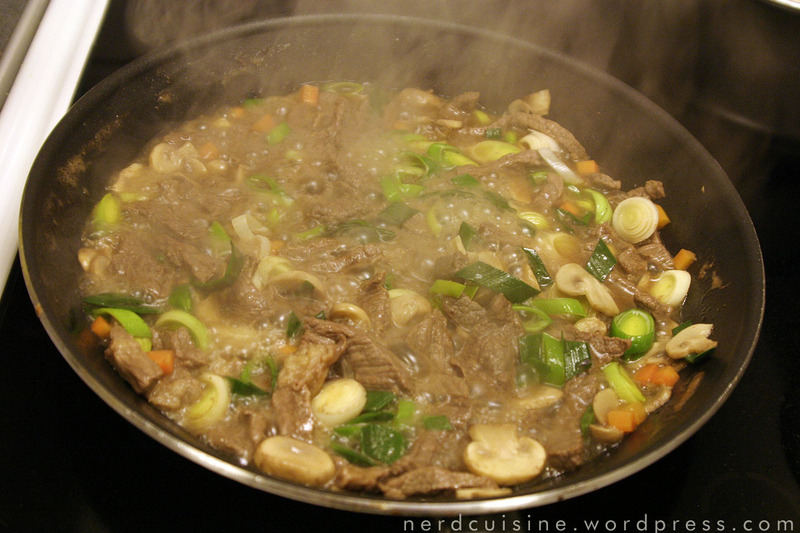 Even though I cut the meat rather thin, round steak is a tough cut of beef and would probably not have objected to a longer (upwards of 30 minutes) simmer on its own. The leeks should be popped in at last minute to achieve heat but not sog. Since the lady I love has Views on the edibility of red cabbage I blanched it separately in the rest of the broth, instead of adding it to the pan. To thicken the fluids, add some arrowroot dissolved in cold water and bring to boil again. 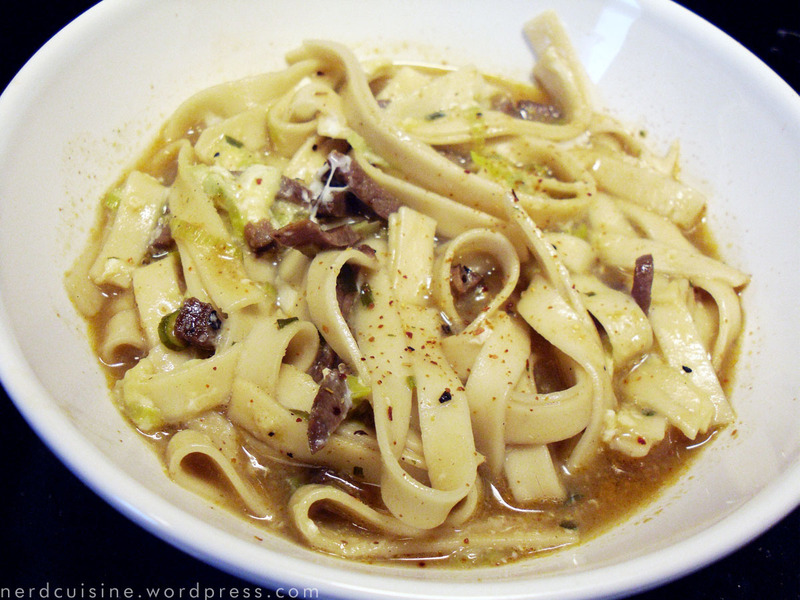 The completed dish. 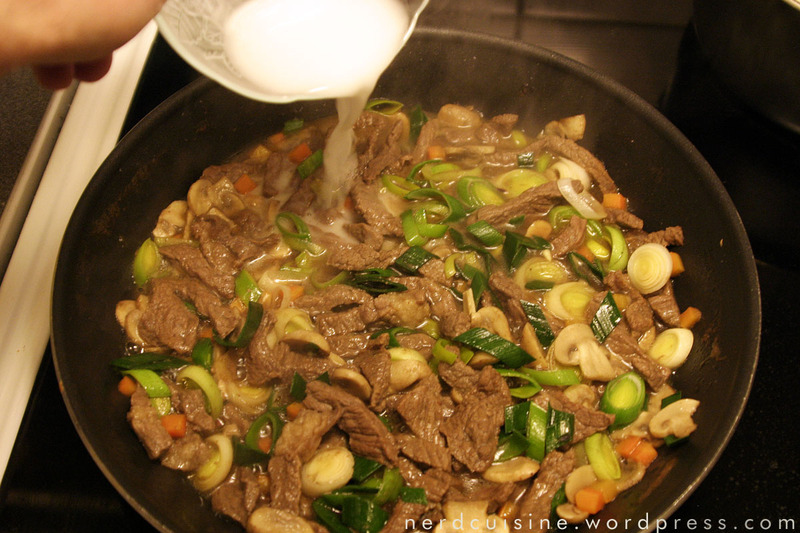 With a more tender cut of beef it can be done inside 15 minutes (the time it takes to cook rice). 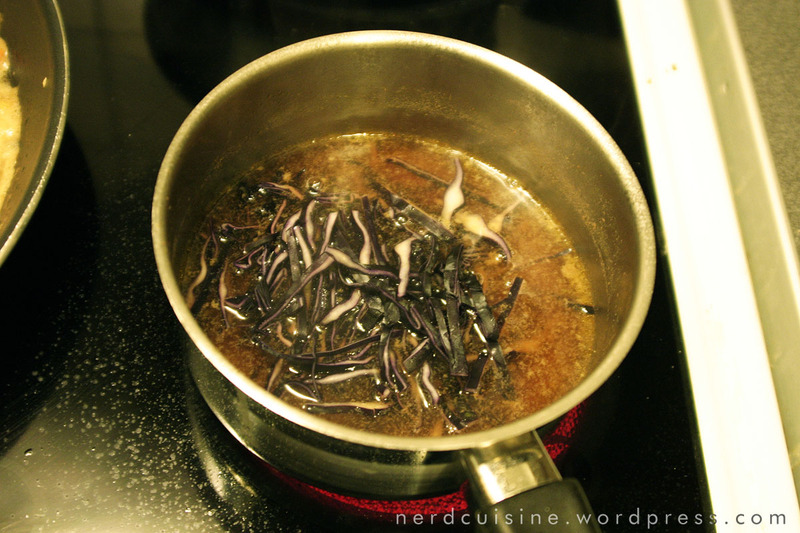 Also keep in mind that the red cabbage will stain everything purple, so use dark soy for better color if you’re going to copy the recipe straight up. I’m not up to date on how common red cabbage is in China, but the green variety is probably more widespread.